If you are fond of toasts in the morning breakfast then you would surely be interested in pop up toasters. It is one of the fundamental appliances of the kitchen for bread toasts. You can find a wide range of toasters on DealsCorner. Instead of visiting different sites you can find all products results from Flipkart, Amazon, Inifbeam, Shopclues, etc. on single platform. Search the product you need, compare the products and prices offered by the various online sites and then choose the product of your choice in the lowest price range available in India. The time consumed using the toaster is comparatively less than the conventional method of toasting the bread. The electrical toasters price may vary depending on the features, model and make of the toaster. The result of the electrical toasters is also better than the conventional method. 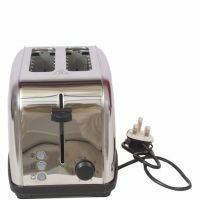 While choosing the toaster there are several points like capacity, materials, timing and additional features to be considered. The capacity of the toasters are an important aspect while choosing the toasters because based on the capacity you can toast the bread slices. The capacity of the toasters range from two slicer to four slicer. The two slicer toaster comes with a lever which pop-ups the toaster at the same time, while the four bread toaster has separate lever which pops-up one bread at a time. The benefit of having separate lever is you can have different settings of toasting. You can also find the conveyor toaster which has even more slicing capacity than the traditional toasters. Toasters are made up of different materials like steel, chrome, plastic, etc. You can find toasters in comination of any of the materials. The sizes may vary dpending on the model and make. You can match-up the material of the toasters with other kitchen appliance, for example if you have an steel finishing refrigerators then you can match it with the steel toasters. Some of the popular toaster materials are chrome, coloured, dual colours finish, and stainless steel. 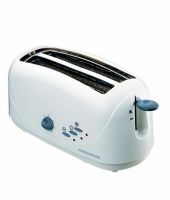 You can find pop-up toasters from any local store but most of the local stores have limited brands or stock. 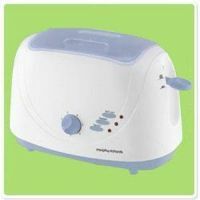 At DealsCorner, you can find a wide range of pop-up toasters from major online stores and brands. You can search the product you need from any page. We have many well-known brands like Philips, Kenwood, Russell Hobbs, Morphy Richards, Euroline, Baltra, Havells, Osters, and many more. You can use the filtering options given on the product search page to narrow the search results. If you wish run a targeted search like listing the products from any specific brand then you can choose the brand filtering option. Use the discount option to list the products with maximum discount offers. Shopping on DealsCorner is simple and easy. Search the product you need, compare the products offered by various online stores and then choose the product of your interest in the lowest price range available in India. Enjoy your shopping on DealsCorner and keep posting your reviews.